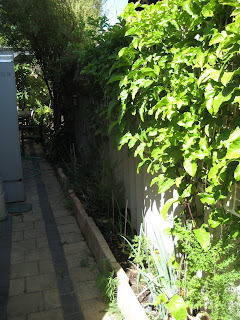 I ended up getting rid of the strawberries as they didn't cascade as I would of liked. 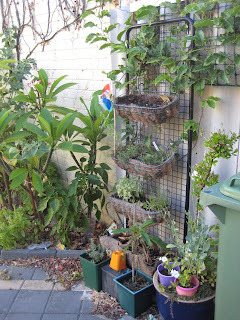 I now have Oregano, French Tarragon, Sage, Basil and Chervil growing on the "wall"
Everything has grown quite a bit. 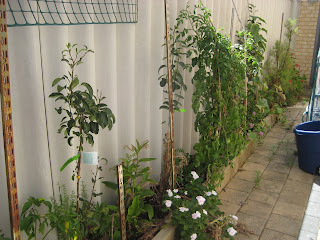 I got rid of the baskets in this area and ended up going with 2 pears and 2 apples (for espalier), intermixed I have comfrey, borage, bergamot, paprika and cucumbers. 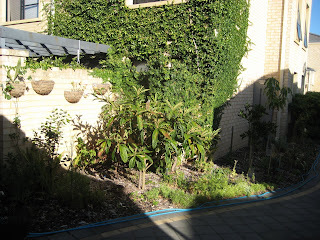 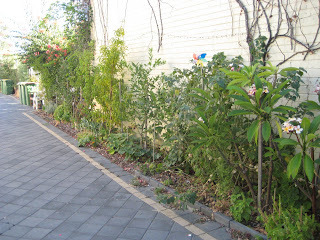 Along here I ended up going Blueberries with spring onions planted amongst them and growing passionfruit as a backdrop.